QuickMSG is a secure messaging format and an Android App of the same name. 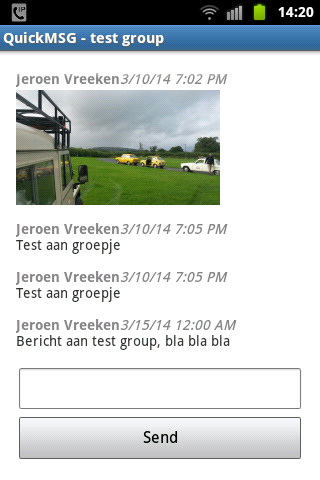 With it you can send messages either to other contacts directly or to groups. Its aim is to combine the ease of use that messaging apps give with the security of encrypted email. What is special about QuickMSG? There is no central QuickMSG server or infrastructure. Your messages will be sent via the existing SMTP/IMAP E-mail infrastructure. Your messages will be sent using encryption from end to end. Nobody in between can read it. QuickMSG uses well known and established PGP encryption. By default QuickMSG will use 2048 bit RSA encryption for each message. You identify with an email address, not with a phone number. QuickMSG is thus not bound to a phone, but can be used on other device types as well. No subject. The subject is not really needed for 'quick' chatting. Besides it isn't encrypted anyway. Easy to setup. Encryption is the default. No need to jump through hoops to setup PGP. Easy group handling. Groups are easy to create and are synchronized to the members automaticly. They can be used the same way as any other contact. To sum up: email with the ease of use of a chat app. Is SMTP and IMAP suitable for instant messaging? The SMTP infrastructure of the internet has been handling huge amounts of traffic for years. Its decentralized nature ensures that no single entity can easily take down communications. And with IMAP messages can be delivered to the receipient almost instantanious. The user experience is not much different from using a central messaging service. You and the contacts you are sending it to (or receiving it from) and nobody else. The message is encrypted from end to end. Only on the end devices is is encrypted/decrypted. Yes, besides simple text messages almost any kind of media can be send. The QuickMSG app can only view images inline in the app itself, but any kind of data can be shared. Is it limited to Android? QuickMSG messages can be sent from any platform. However I only made an Android app. There is nothing that prevents creation of an app or plugin or whatever for your platform of choice... somebody just has to do it. There is a command line tool for Linux, it is working, but mostly usefull for experiments and not very userfriendly. The QuickMSG app is licensed under the GNU GPL v3. Note that this license applies to the implementation, not the message format. You can still use the message format in your own program under any license you want. Some of the libraries it uses are licensed under the MIT license or Apache license or CDDL/GPL v2 license with classpath exception. The following sources are here for historical reasons. Current versions of the QuickMSG source have these integrated.